We live so worried about God’s will for our lives. I know how frustrating it can be when we know we have to make decisions, but we don’t know how to proceed. Like me, you may be asking yourself, how can I know? Is all through prayer, His Word and over all Faith in His guidance. Even if things don’t make sense now and the way God is taking you may not seem “normal” to your thinking when you trust Him that all His plans are to prosper you and not to harm you; you will be able to move in Faith. Today understand God knows. 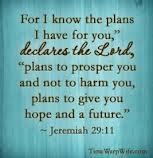 His plans are perfect. Just Trust Him.